The evening saw the networking dinner. 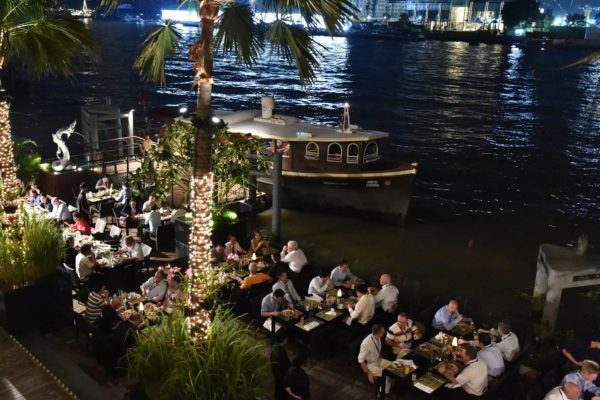 The buffet was immaculate as always at the Royal Orchid Sheraton hotel and the delegation was able to reconnect and chat in a relaxed and informal setting next to the Chao Phraya river. Day two of the conference got underway with a few words from conference director Neil McRitchie. He thanked the delegation for their continued support before introducing the first prestigious keynote speaker of the event John Bigley, managing director of Jamestrong Packaging – Australia & New Zealand. Jamestrong is billed as the ‘new, old kid on the block’ formed on 31 December 2014. The company has been in the industry for several decades and deals with major fillers such as Heinz and Unilever, among many others around the world. The company has five operations in Australasia and produces 450m food cans and 150m aerosols each year across the business. ORG Packaging China is the ‘big sister’ company of Jamestrong, which gives them access to a high quality R&D department and allows them to share purchasing information. The company has recently completed a deal with KBA MetalPrint to install an eight-colour MetalStar 3 machine at its Milperra facility in New South Wales, Australia. Next up, Jeff Hartung from Applied Vision presented on ‘Lights, Camera, Action.’ Colour inspection is a very important aspect of the metal packaging industry. Hartung spoke about how we inspect cans today and the challenges of in-line decoration inspection. “The human eye can be tricked and it is not the best way to inspect a can. Colours can appear differently depending on the environment.” He showed a series of slides showing what appeared to be different coloured images, but which were in fact the same colour looked at with different backgrounds. He took us through the history of Applied Vision’s systems, ending with the latest Orion 100 per cent in-line inspection technology. This presentation was followed by Flemming Olesen, managing director of Jorgen Windelev.Flemming looked at his company’s unique method of colour separation for making printing plates and how Windelev technology can produce photorealistic images on two-piece cans. The plates are direct laser engraved using plate merger screen technology – a process the company invented and developed over 25 years. It is a dry offset process that uses less ink than conventional methods. The punch hole system also enables a faster set up time. The plate merger technique produces a flat image that removes the need to print wet-on-wet with the inks at the decorator. All dots are side by side on the blanket, leaving a small gap between dots. Flemming showed how this method can save ink and therefore money, with one plate producing up to 20 million impressions, the record being 55 million with a single plate. Christof Frohs from Ibea then took the stage to look at high end can inspection. Ibea is an integrator and developer of can making inspection systems providing 24 hour support worldwide to some 2,000 systems installed. The systems Ibea offer can be fully integrated and are available in three sizes. It was interesting to learn about double snap technology, which uses one camera to take two independent images of a can on the line. This saves space on the line. The Décor Inspection system allows customers to inspect up to 15 decors at one time. Pride Engineering’s Greg Pickert followed, focusing on maximising bodymaker uptime. Overall equipment effectiveness will increase productivity and Pickert showed how his company’s systems can help to maximise the number of good cans you produce. Feeler gauges are inaccurate according to Pickert, as an overtravel cycle takes just seven milliseconds. The Guardian II 4 overtravel monitoring system can compare to this high speed, and in the same seven milliseconds it can measure 140 different sets of data to monitor for undesireable events. Jack Knight chaired the next session, introducing Christian Bretzing of Kartonfabrik Porstendorf, Gerhard Grossmann from KBA-MetalPrint, who spoke about the MetalStar3 and how it can lead to significant cost savings, and Lily Zhang, sales director of Xiamen Baofeng. Zhang gave the delegation an overview of the company and its position within the Asian marketplace. Established in 2012, the company has 16 conversion lines with a capacity of 18bn easy open ends per year, 10.8bn of which is dedicated to 202 ends for the two-piece sector. It is the largest producer of easy open ends in China, producing 113, 200, 202, 206 and 209 sizes for both carbonated and non-carbonated products. Its major partners include Pacific Can and Crown. Greg Frisby of Sensory Analytics spoke before the lunch break, on the latest advancements in film weight measurement and coating process control. Weight checks, capacitance gauging and optical tools can all be used in film weight measurement and Frisby expanded on the benefits of using the Specmetrix system from Sensory Analytics. The system can measure all container coatings, both internal and external, giving customers accurate data that could lead to cost savings through less waste and less over-application of coatings. The company has recently entered into a partnership with Monster Energy, which will only be using containers that have been measured by Specmetrix – an important aspect for potential suppliers to consider. After lunch, Michael Calahan from IPS spoke about how to improve front end performance, before Francesco Amati of Pneumofore presented the company’s solutions for vacuum and compressed air solutions for cans. Siegfried Christ of Mall/Herlan then spoke about the evolution of the hybrid bottle and how dry offset can be combined with digital printing. Bud Patel from Pressco rounded off the day’s presentations with his talk on colour inspection. It was interesting to see the various defects that can be detected using the Decospector 360 machine. Tabletop exhibitions followed, and the room was once again bustling with people. Many who had presented were visited on-stand to further discuss their various offerings and feedback received from exhibitors suggested that the attendance was once again very good. 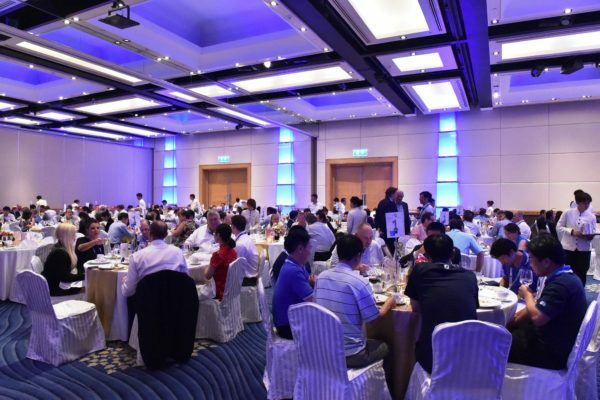 That evening the gala dinner took place, kindly sponsored by VMI (represented by Johan Jonkman), and included the Asia CanTech Awards ceremony. Bhatia covered the government’s Make in India campaign, a programme to promote business and industry in India, and how HTW is developing its business in the country. He spoke of the company’s joint venture with Rexam, which saw an increase in two-piece can manufacture in India from 50m to 1.2bn cans per year over a seven-year period. Mark Hoche, head of sales at CMB Engineering, followed Bhatia with a presentation on the company’s growth over the past few years. CMB has extended its capacity by some 9,000 square metres at its Shipley site in the UK and continues to extend its reach around the world. Hoche spoke mainly of CMB’s new 3200 Reformat spray machine, which enables quick changeovers, ease of use operators and low cost of ownership. The mechanical cambox was replaced with a servomotor, which allows operators to control the machines’ speed more easily, reducing the need to stop individual machines on the line. Intralox followed with a presentation on how flexibility and low energy will lead to the can lines of the future, and then Mark Mohn from Prime Controls gave a history of can making and how technology has developed to solve the various problems encountered along the way – particularly for issues such as leak detection and double end detection. George Bartosh of Intech followed with a look at the history of his company and that of the can making industry. Intech has a long history of innovation and the presentation was well received by the delegation. NPB were next up with a look at can line automation, followed by Marcel Schoumacker and Benny Liu of Schuler. They looked at the history of Schuler within the metal forming industry and how the company’s products could help can makers to innovate. Even in parts of the Asian can making industry where equipment can be older and not the latest technology, this doesn’t mean the Overall Equipment Effectiveness (OEE) can’t be measured to optimise performance. Paul Barber of Lighthouse Systems was next up to explain how. AVT looked at advanced inspection solutions, before Harry van Tuyn, CEO of Rosario, concluded the presentation schedule with his report on the importance of print quality in the can making industry, which was followed by a final table top exhibition session. The conference was a huge success, and the organisers would like to thank our distinguished speakers, exhibitors and delegates for making it an informative, useful and productive three days in Thailand. We look forward to seeing you all next year.